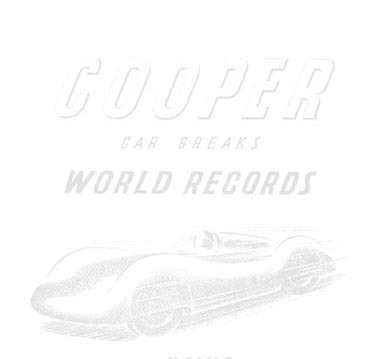 This page deals with the later cars that originated from the original Cooper record breaker. They are listed in the order in which they were originally built as record breakers and details of their later history are given when known. This is meant to be a work-in-progress page, so contributions will be most appreciated. As already mentioned, the Coopers built a second streamliner in 1953 for Eric Brandon, based on a new chassis: the body was very similar to the original car and was still made of aluminium, but was lighter and somewhat simplified. It was successfully run at Montlhéry (apparently unpainted) in October 1953 when it set a total of 15 records: 7 in class J (all the same as in 1951, plus the 200 Miles), again the same 7 records in Class I, plus the 200 km in class H. After an early unsuccessful attempt to the H Class record, Eric Blandon had to leave for other engagements, so all the records were again set by John Cooper himself. (Photo at left from "Cooper Cars" by Doug Nye; photo at right from Autosport magazine). The car was then sold to Pete Lovely of Santa Barbara, CA, who installed a Porsche engine and raced it successfully as a sports car. It was known as a Pooper, a name that also applied to other Porsche-powered sports cars with Cooper chassis. 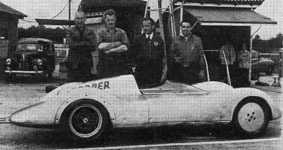 Although it was later modified, in its earlier sports racing career Lovely's car still looked pretty close to its original looks (photo at left from www.tamsoldracecarsite.net, shows the car at Pebble Beach in April 1956. Go to that site to see it larger. Photo at right from unrecorded web source: if you recognise it, just let me know and I will acknowledge it). The car still exists and is seen regularly in historic races. There is little doubt that Lovely’s car was originally Brandon's T28, as the headrest streamlining is identical and much shorter that on the original John Cooper streamliner, which was later sold to John Fox Jr. So Lovely's cannot be Fox' Bonneville car. Confusion might originate from the fact that John Fox Jr. was an official Cooper dealer, so it is likely that Lovely did buy his car via John Fox, although it was Brandon's and not the Bonneville car. 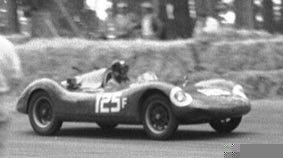 A similar attempt to Class J (350 cc) records with a JAP engine ended after just a few miles due to a valve failure, but the 1964 FIA list of standing records show a record set at Montlhéry in June 1958 by Owen and Knight for 500 miles in Class K (250 cc): the car is listed as "Owen", but I would assume it was their Cooper streamliner. I could not find any other reference to this attempt, so I do not know wether oher records zere set on the same attempt. In October 1958 Bill Knight drove again the streamliner for the last time, at Thurleigh (an airfield? ), to set a standing start mile record in Class J (350 cc) at 76.6 mph, again with a Norton. The photo you see on the right, the only one I found (from Classic & Sportscar magazine) shows that the roof had been removed and some other changes might have been carried to the tail section of the body. Any additional photos would be most welcome. The car was later sold in Canada, were it was adapted to road racing by installing a Porsche engine and raced without much success. The Porsche was then replaced by a Coventry-Climax 1.100, and the car was acquired by Michael Gee, who further shortened the body and raced it successfully in the mid-sixties (photo courtesy Mike Gee). History of the car after 1968 is still unknown.